Explore Texas, New Mexico and Arizona with varied landscapes and cultures on this adventure packed American Southwest culture tour. Attractions on the first half of the tour include Sedona, Santa Fe, and Taos– each giving insight into the lives of early inhabitants of the Southwest region and the history of settlement. Tour the pueblos at Hopi Second Mesa and Acoma Sky City, while viewing beautiful arts and crafts, then celebrate Native culture at the Gathering of Nations Powwow in Albuquerque. Landscapes you’ll see include the Grand Canyon, Petrified Forest, and Carlsbad Canyons National Parks. For more details and information visit Southwest Native Trails. Welcome to Phoenix, Arizona, vibrant city, full of art and culture, in the middle of the Sonoran Desert. Meet in the lobby of our base hotel at 4 pm for a visit to the beautiful Desert Botanical Gardens, abounding with native cacti, animals, and cultural exhibits. We enjoy dinner together, get to know each other and discuss the upcoming tour. Each participant receives a tour documents. For further information, please click on each picture. We travel north through Sonoran desert landscape, home to Saguaro cacti as tall as trees, and make our first stop in the artist community of Sedona. Our route continues through scenic Oak Creek Canyon up to Flagstaff. On walks at Sunset Crater and Wupatki National Monuments, we immerse ourselves in the volcanic history of the landscape and the human history of the Native Americans. Two nights in the lodge decorated with Native American art at Cameron Trading Post. Today’s highlight is world famous Grand Canyon National Park. We enjoy the awe inspiring view from different vantage points, explore the Desert View Drive, stop at Desert View Watchtower, and wander along the rim at Hermit’s Rest, depending on snow conditions. The views from the most impressive canyon of the world are unforgettable. An optional helicopter trip can be reserved. Today we experience the Native Hopi culture up close during a guided tour of Second Mesa. On short walks in the Petrified Forest we explore the beautiful colors of million-year-old tree trunks–the largest collection of petrified wood in the world. We discover Indian Petroglyphs dated back to ancient times. In this area one of the most diverse collections of prehistoric pottery fragments have been found within the Southwest area. Night in Gallup, New Mexico on Route 66. We drive on the Mother Road, or Route 66. A Native American guide takes us through the Acoma Sky City Pueblo, where we experience pueblo culture and view pueblo pottery. 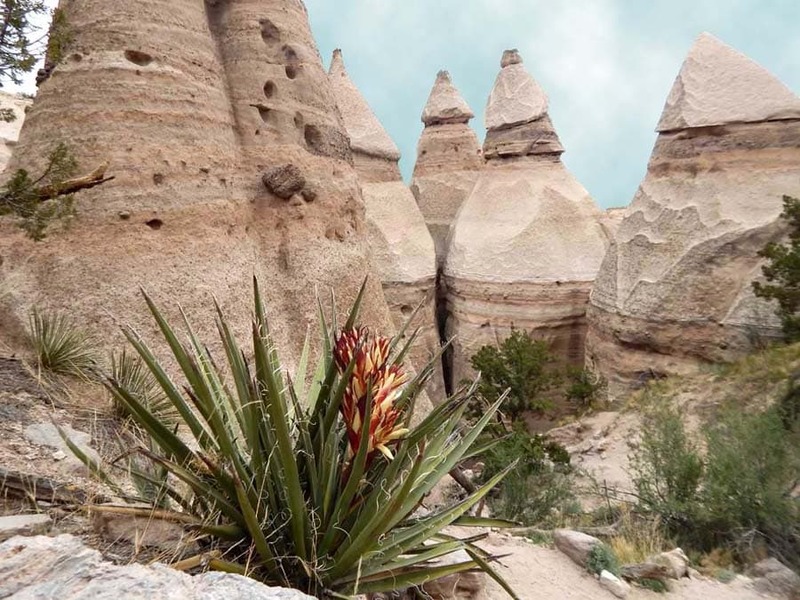 Further on, we wander amid the bizarre, eroded rock formations at Tent Rock National Monument. We spend the evening and two nights in culturally stimulating historic Santa Fe, enjoying the rounded lines of the Spanish colonial adobe architecture. 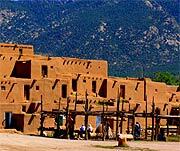 Two nights in Santa Fe Inn in walking distance to the historic downtown. We leisurely stroll through Santa Fe stopping at museums, and the many art galleries and Native American artisans in Old Town, which are accessible by foot from our hotel. A scenic excursion to Taos enriches our New Mexico cultural experience. Together we share todays adventures over a Spanish inspired meal at one of the excellent restaurants of Santa Fe. Today’s highpoint is the largest Powwow of the U.S., The Gathering of Nations. Thousands of Native Americans and First Nations peoples from different tribes of the U.S. and Canada gather once a year for this occasion. There are traditional dances from morning to evening. Native art and music are on display in a huge, covered arena in Albuquerque. This is a once in a lifetime experience of Native American culture. We stay in Fort Sumner. and Mescalero Apaches were held captive. An other-worldly adventure takes us to Carlsbad Caverns National Park, America’s largest and most photographed cave system. We dip into the mysterious underworld. Later in the day we cross the state line into Texas and drive along the Pecos River through the town of Pecos to our oasis in the desert at the Indian Lodge near Fort Davis. Two nights.